An excavator extracting sand and stones materials in Samanpur. 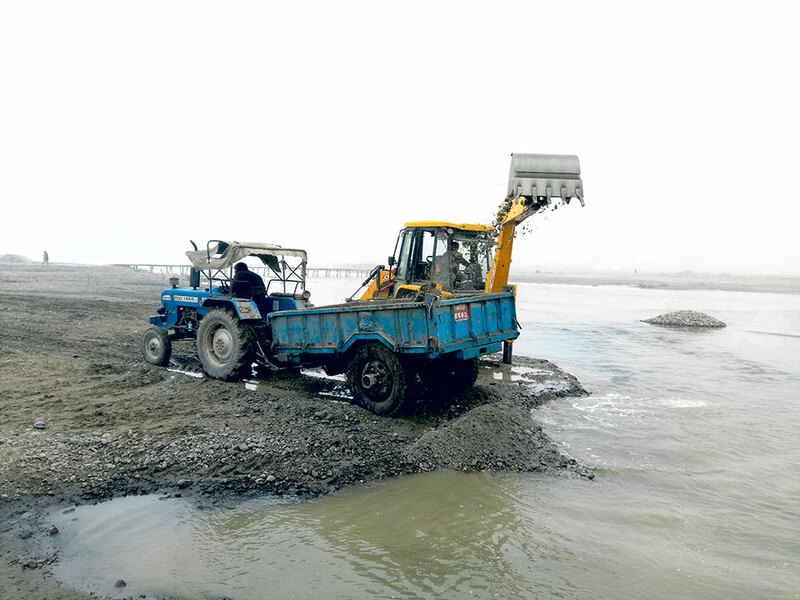 RAUTAHAT, Feb 22: A squad of Area Police Office (APO), Samanpur on Monday arrested two individuals and seized their excavator while they were illegally excavating stone and gravel from the Bagmati River in Rautahat at midnight. Acting on a tip off, police had reached the river bank in Gadhimai Municipality-1 where they caught the duo red handed while extracting gravel from the river. They were using an excavator having no number plate and were extracting the gravel without taking permission from the District Coordination Committee (DCC). Police have arrested the excavator driver Ganesh Magar, 20, of Bhandar Municipality-10 of the district and helper Paras Sahani, 25, of Gadhimai-2, Samanpur. 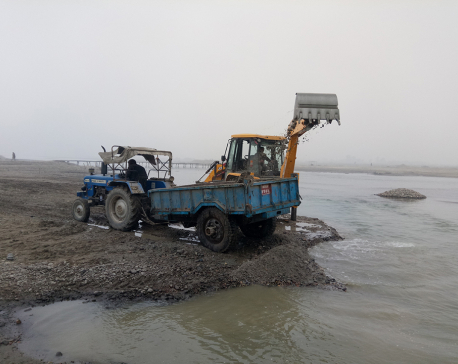 Two months ago, the DCC had allowed an excavator in the Bagmati River to extract gravel, sand and boulders for development purpose of the district. However, the work was completed on February 17. As soon as the construction company removed its excavator from the site, some locals started rampantly extracting gravels from the river. SP Yagya Binod Pokhrel, chief of Rautahat Police, informed that the arrested individuals have already been brought to the District Police Office (DPO) for further investigation. Similarly, in another section of the Bagmati River which lies 800 meters south from Karmaiya bridge, the DCC had given permission to Sah Construction Company to extract materials by digging 200 meters of the river. However, the company is using two excavators and is excavating materials from more than 400 to 500 meters below the surface. Likewise, there are various other places where the permission of using excavators has been misused. Though the government stopped renewal of license of crusher industries, Shiva Shankar Crusher Industry (SSCI) has been illegally extracting stones, gravel and sand from the river and storing them in its storage. Kritiraj Subedi, an officer of DCC, informed that action will be taken against SCCI if the allegations are proved. Despite being aware about the illegal excavation, responsible authorities have remained mum. This has further encouraged the mafias.